If you've read about me in Survival of the Fritters, you'll know why National Police Week (May 13 - 19 this year) can be difficult for me. I'm not going to dwell on that, though. I'll let you catch glimpses of some of the police officers who are in my life now. Beside the space obviously reserved for a band, a break in the white drapes revealed glossy pine double doors. A squarish red glow lit the white drapes above the doors. “Well,” my father-in-law grumbled, “I guess people will be able to see the exit sign after one of those candles on the tables tips over and the room fills with smoke.” We turned around. The exit sign above the door we’d used wasn’t clearly visible, either. We went out that way, into the service corridor. “There are lots of places to hide in that banquet hall,” Tom commented. I laughed again. And then I sobered and asked him, “Do you know something about Roger?” Maybe when Tom was police chief, he had arrested or charged Roger. . . . I leaned my head back on the soft headrest and gazed up at the sky, that dusky blue preceding twilight. “I’m sure he misses Alec and wonders what he could have done differently that night.” Just like I wondered what I could have done differently . . . Brent and Alec had been best friends as well as partners, first as patrolmen, and then as detectives. “Maybe I said ‘hi’ to him this evening.” Actually, I couldn’t remember saying anything. I’d stared back at him, and that was all. “I’m just saying what I think.” I patted my lap. “Dep, come here. I’m getting cold.” Dep turned her back, sat in the grass, and stared toward my rosebushes. And then there's Detective Brent Fyne. I'm afraid I don't know what else to say about him besides what I said in the above conversation with Misty. 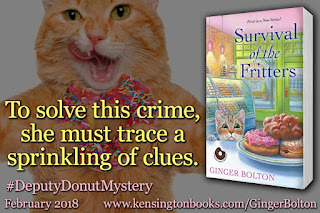 Note from Ginger: Cops & Doughnuts, a bakery in Clare, Michigan, was one of the prime inspirations for the Deputy Donut Mystery Series. 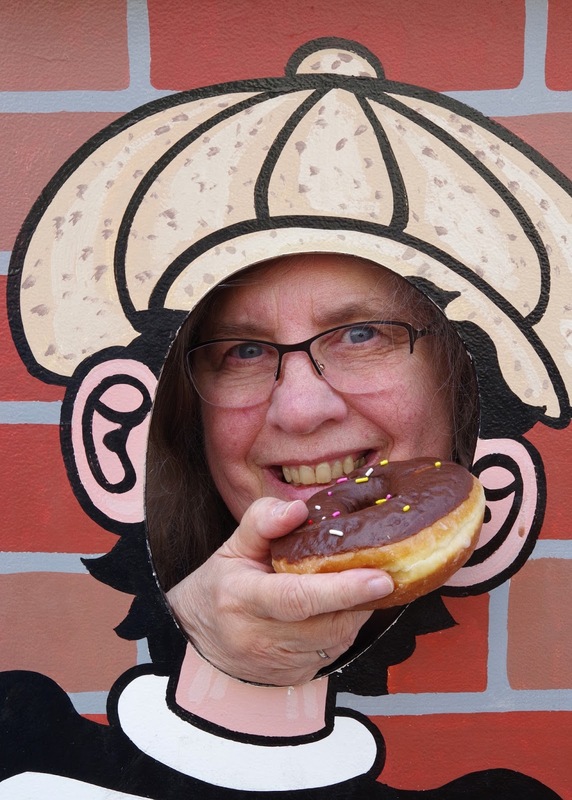 Here I am at Cops & Doughnuts, posing as a criminal and eating one of their criminally delicious fudge-frosted donuts. Do you have friends in law enforcement? Do they like donuts or avoid the stereotype? For a chance to win a copy of Survival of the Fritters, please answer below with your e-mail address in a bot-resistant form like name at mail-server dot com. I'd love to win this book! I haven't heard of this series yet, but now I definitely want to read it! 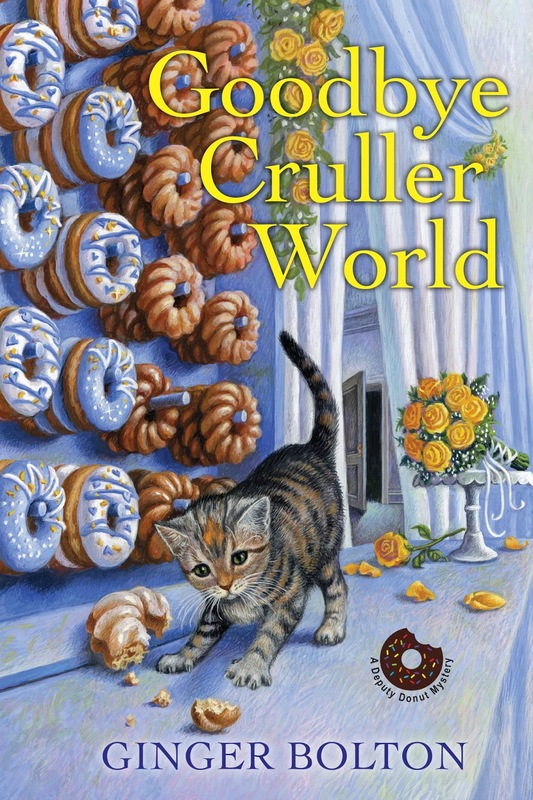 The cover is adorable, too! My husband is retired from the state police. They used to enjoy the stereotype and joked about it a lot. I have wanted to read your book since I first read reviews. Thanks for the opportunity. My Uncle Gary was a motorcycle policeman, an FBI agent and a county sheriff. I am not sure if he ate doughnuts, but he loved enchiladas! I use to work for a city department that fell under the police department umbrella so I know lots of police officers. I don't know of a one that would be the least bit embarrassed or mad about being offered a donut and none of them would ever think of turning one down if offered one. :) I can sure think of a lot worse things to be associated with than a sweet, yummy donut or fritter. 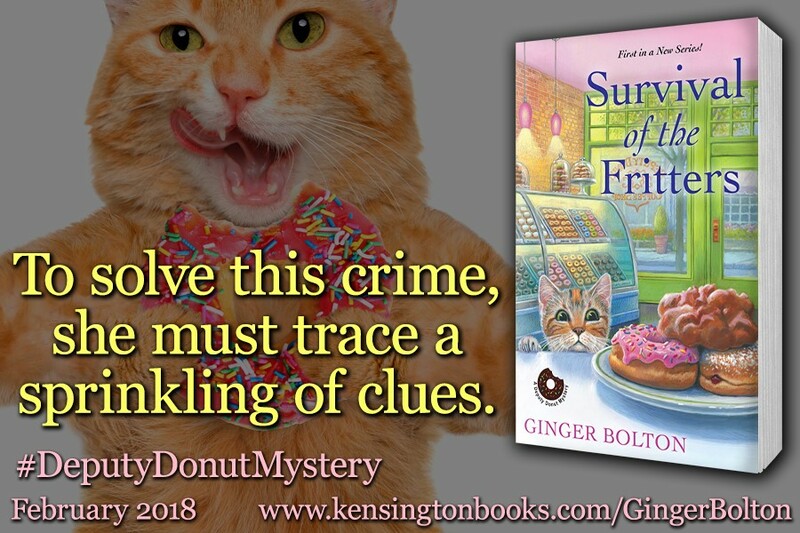 Thanks for the chance to win a copy of " Survival of the Fritters"! Yes please I'd love to win this book. I know my youngest daughter would love it Her husband is an adrenaline junkie who is a volunteer Para-Medic with Hatzolah (largest volunteer group in the US) the Lt. of the town's volunteer fire dept. AND a member of the NYPD. No friends or relatives in law enforcement. I can certainly see her point about the dangers of being in this line of work! yes friends in law enforcement, and military. Can be very dangerous. Although donuts are liked and appreciated, neither one indulges much! Bothmust stay “fighting fit” as they say. The youngest is a submariner. I do not have friends in law enforcement. Can't wait to read this book, though!! mcastor07 (at) gmail (dot) com. This book looks really good. I love cozy Mysteries. Thanks for the chance at the giveaway. I have an old family friend who is a detective, but he's not fond of donuts. I would love to win , rhybirch (at) gmail (dot) com . I used to know a cop who would only sneak a good donut when no one could see him. I don't know anyone in law enforcement, but I've seen our local police in Dunkin Donuts. This is a new author and series to me, would really like to read. No friends in law enforcement, but I LOVE donuts. My son works in law enforcement. I love donuts, bought some yesterday. Thank you all for your comments. I should mention that Emily is quick to point out that cops loving donuts is a stereotype. But most people like them, at least once in awhile! Congratulations to Rita Wray, the winner of a copy of Survival of the Fritters! I'll be in touch with you, Rita.